Review deployments based on two sample use cases that are used as examples throughout the chapter. Use the docker run command with the ICM image provided by InterSystems to start the ICM container and open a command line. Obtain the cloud provider and SSL/TLS credentials needed for secure communications by ICM. Decide how many of each nodes type you want to provision and make other needed decisions, then create the defaults.json and definitions.json configuration files needed for the deployment (you can use the provided templates for this purpose). Use the icm provision command to provision the infrastructure and explore ICM’s infrastructure management commands. Run the icm run command to deploy containers, and explore ICM’s container and service management commands. Run the icm unprovision command to destroy the deployment. For comprehensive lists of the ICM commands and command-line options covered in detail in the following sections, see ICM Commands and Options. Distributed cache cluster  Mirrored data server, three application servers, arbiter node, and load balancer. This deployment is illustrated in the section Distributed Cache Cluster Definitions File. Basic sharded cluster  Shard master data server and three shard data servers. This deployment is illustrated in the section Sharded Cluster Definitions File. Most of the steps in the deployment process are the same for both configurations. The primary difference lies in the definitions files; see Define the Deployment for detailed contents. Output shown for the provisioning phase (see The icm provision Command) is from the distributed cache cluster; output shown for the deployment phase (see Deploy and Manage Services) is for the sharded cluster. ICM is provided as a Docker image. Everything required by ICM to carry out its provisioning, deployment, and management tasks  for example Terraform, the Docker client, and templates for the configuration files  is included in the ICM container. Therefore the only requirement for the Linux, macOS or Microsoft Windows system on which you launch ICM is that Docker is installed. ICM is supported on Docker Enterprise Edition and Community Edition version 18.09 and later; Enterprise Edition only is supported for production environments. To download and run the ICM image, and to deploy the InterSystems IRIS container and others in the cloud using ICM, you need to identify the repository in which these InterSystems images are located and the credentials you need to log into that repository. The repository must be accessible from the internet (that is, not behind a firewall) in order for the cloud provider to download images. Download the ICM image from the repository if it is not already present locally (can be done separately with the docker pull command). Creates a container from the ICM image (docker create command). Start the ICM container (docker start command). The -i option makes the command interactive and the -t option opens a pseudo-TTY, giving you command line access to the container. From this point on, you can interact with ICM by invoking ICM commands on the pseudo-TTY command line. The --cap-add SYS_TIME option allows the container to interact with the clock on the host system, avoiding clock skew that may cause the cloud service provider to reject API commands. The ICM container includes a /Samples directory that provides you with samples of the elements required by ICM for provisioning, configuration, and deployment. The /Samples directory makes it easy for you to provision and deploy using ICM out of the box. Eventually, you can use locations outside the container to store these elements and InterSystems IRIS licenses, and either mount those locations as external volumes when you launch ICM or copy files into the CIM container using the docker cp command. printf "\nRemoving icm container...\nContainer removed:  "
You can mount multiple external storage volumes when running the ICM container (or any other). For detailed information about the InterSystems IRIS feature that lets you store instance-specific data outside the container, see Durable %SYS for Persistent Instance Data in Running InterSystems IRIS in Containers. On a Windows host, you must enable the local drive on which the directory you want to mount as a volume is located using the Shared Drives option on the Docker Settings ... menu; see Using InterSystems IRIS Containers with Docker for Windows on InterSystems Developer Community for more information. ICM communicates securely with the cloud provider on which it provisions the infrastructure, with the operating system of each provisioned node, and with Docker and several InterSystems IRIS services following container deployment. Before defining your deployment, you must obtain the credentials and other files needed to enable secure communication. To use ICM with one of the public cloud platforms, you must create an account and download administrative credentials. To do this, follow the instructions provided by the cloud provider; you can also find information about how to download your credentials once your account exists in the Provider-Specific Parameters section. In the ICM configuration files, you identify the location of these credentials using the Credentials parameter. When using ICM with a vSphere private cloud, you can use an existing account with the needed privileges, or create a new one. You specify these using the Username and Password fields. Public key of SSH public/private key pair used to enable secure connections to provisioned compute nodes; in SSH2 format for AWS and OpenSSH format for other providers. Private key of SSH public/private key pair. Directory containing TLS keys used to establish secure connections to Docker, InterSystems Web Gateway, JDBC, and mirrored InterSystems IRIS databases. You can create these files, either for use with ICM, or to review them in order to understand which are needed, using two scripts provided with ICM, located in the directory /ICM/bin in the ICM container. The keygenSSH.sh script creates the needed SSH files and places them in the directory /Samples/ssh in the ICM container. The keygenTLS.sh script creates the needed SSL/TLS files and places them in /Samples/tls. You can then specify these locations when defining your deployment, or obtain your own files based on the contents of these directories. For more information about the security files required by ICM and generated by the keygen* scripts, see ICM Security and Security-Related Parameters in the “ICM Reference” chapter. The keys generated by these scripts, as well as your cloud provider credentials, must be fully secured, as they provide full access to any ICM deployments in which they are used. The keys by the keygen* scripts are intended as a convenience for your use in your initial test deployments. (Some have strings specific to InterSystems Corporation.) In production, the needed keys should be generated or obtained in keeping with your company's security policies. To provide the needed parameters to ICM, you must select values for a number of fields, based on your goal and circumstances, and then incorporate these into the defaults and definitions files to be used for your deployment. (See Configuration, State and Log Files for information about these files.) You can begin with the template defaults.json and definitions.json files provided in the ICM container in the /Samples directory tree, for example /Samples/AWS. The difference in the deployment processes for the two target configurations described at the start of this chapter lies primarily in their separate definitions files. Field values they can share are included in a joint defaults file, while the nodes that must be provisioned and configured for each deployment are specified in their definitions files. The following sections provide the content of both the shared defaults file and the separate definitions files. Each field/value pair is shown as it would appear in the configuration file. Note that the fields included here do not represent an exhaustive list of all applicable fields; see ICM Configuration Parameters for information about these and all ICM fields. In general, which fields are included in defaults.json and which in definitions.json depends on your needs, but as noted in Configuration, State and Log Files, defaults.json is often used to provide values for multiple deployments in a particular category, for example those that are provisioned on the same platform, while definitions.json provides values for a particular deployment. In this case, because both deployments are on AWS, if we assume that they also use the same credentials, deploy the same InterSystems IRIS image, and include Weave Scope monitoring, those fields can be included in defaults.json, while the fields that differ go in definitions.json. The tables are ordered to reflect this approach. As previously noted, some fields, such as Provider, must appear in the defaults files. The separate definitions files can be specified in an option on the provisioning command line, or the appropriate file can be swapped in as definitions.json in the current working directory before the icm provision command is executed (see Provision the Infrastructure). For more information about the parameters listed in these tables, see ICM Configuration Parameters. InterSystems IRIS is already installed in the InterSystems container (or the container you created based on it) deployed by ICM, and ICM automatically configures InterSystems IRIS after it is deployed, as needed for the role of each instance. There are, however, a number of ICM fields you can use to configure the InterSystems IRIS instances differently from the InterSystems IRIS and ICM defaults, for example the ISCglobals field used to configure the database caches of the instances defined in the sample Sharded Cluster Definitions File. Information about InterSystems IRIS configuration settings, their effects, and their installed defaults is provided in the Installation Guide, the System Administration Guide, and the InterSystems Parameter File Reference. The field/value pairs shown in the following table represent the contents of a defaults.json file that can be used for both the distributed cache cluster deployment and the sharded cluster deployment. The pathnames provided in the fields specifying security files in this sample defaults file assume you have placed your AWS credentials in the /Samples/AWS directory, and used the keygen*.sh scripts to generate the keys, as described in Obtain Security-Related Files. If you have generated or obtained your own keys, these may be internal paths to external storage volumes mounted when the ICM container is run, as described in the Launch ICM. See ICM Security and Security-Related Parameters for additional information about these files. Amazon Web Services, required details; see About AWS Regions and Availability Zones. Default AWS AMI and instance type to provision. Default size of data storage volume (overriding ICM default). See .About AWS AMIs and About AWS instance types. Nonroot account with sudo access used by ICM for access to provisioned nodes. Needed credentials and key files; because provider is AWS, the SSH2format public key in /Samples/ssh/ is specified. Install Weave Scope, optionally provide authentication credentials; see Monitoring in ICM in the “ICM Reference” chapter. Latest InterSystems IRIS image, credentials to log into Docker repository, version of Docker to install; see Identifying the Repository and Image and General Parameters. In addition, the Mirror field must be set to True in the definitions file, as it is not used in the sharded cluster deployment and thus cannot appear in the defaults file. The table that follows lists the field/value pairs that are required for this configuration. 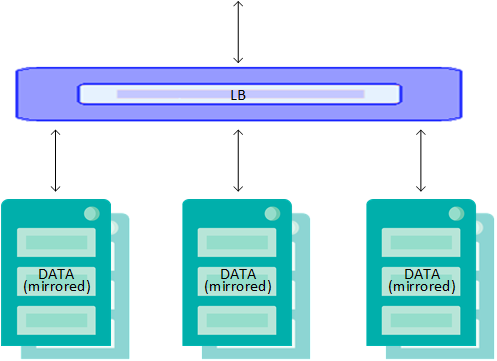 If Mirror is True, when two DM nodes are defined, they are mirrored. Two data servers using a standard InterSystems IRIS license. Instance type and data volume size override defaults file (see Shared Defaults File);. Automatically configured as a mirror due to Mirror setting (previous row). Three load-balanced application servers using a standard InterSystems IRIS license, naming starts at 0003. Load balancer is provisioned automatically when LoadBalancer is True. Arbiter node for data server mirror. Use of arbiter Docker image overrides iris image specified in defaults file. No license needed, naming is 0006. Instance type overrides defaults file. "Role": "AR"
One shard master data server (role DM). Three shard data servers (role DS). Shard master data server using an InterSystems IRIS sharding license. Instance type overrides defaults file due to database cache requirements. Database cache size specified (8KB block size). Data volume size overrides defaults file. For more detailed information about the specifics of deploying a sharded cluster, such as database cache size and data volume size requirements, see Deploying the Sharded Cluster in the “Horizontally Scaling InterSystems IRIS for Data Volume with Sharding” chapter of the Scalability Guide. ICM provisions cloud infrastructure using the HashiCorp Terraform tool. ICM gives you the option of provisioning your own existing cloud or virtual compute nodes or physical servers to deploy containers on; see Deploying on a Preexisting Cluster for more information. The icm provision command allocates and configures compute nodes, using the field values provided in the definitions.json and defaults.json files, as well as default values for unspecified parameters where applicable. By default, the input files in the current working directory are used; you can specify another location using the -definitions and -defaults options. In the case of the separate definitions files for the two target configurations (see Define the Deployment), the appropriate file can be swapped in as definitions.json in the current working directory before the icm provision command is executed. If you use the -definitions or -defaults options to specify a nondefault location for one or both of these configuration files, you must also do so for all subsequent ICM commands you run for this deployment. For example, if you execute icm provision -defaults ./config_files, you must add -defaults ./config_files to all subsequent commands you issue for that deployment. While the provisioning operation is ongoing, ICM provides status messages regarding the plan phase (the Terraform phase that validates the desired infrastructure and generates state files) and the apply phase (the Terraform phase that accesses the cloud provider, carries out allocation of the machines, and updates state files). Because ICM runs Terraform in multiple threads, the order in which machines are provisioned and in which additional actions applied to them is not deterministic. This is illustrated in the sample output that follows. At completion, ICM also provides a summary of the compute nodes and associated components that have been provisioned, and outputs a command line which can be used to delete the infrastructure at a later date. Unprovisioning public cloud compute nodes in a timely manner avoids unnecessary expense. Because the -stateDir option to the icm unprovision command is mandatory, you may find it convenient to copy the icm unprovision command provided in the output, so you can easily replicate it when unprovisioning. This output also appears in the icm.log file. The following example if excerpted from the output of provisioning of the distributed cache cluster described in Define the Deployment. During the provisioning operation, ICM creates or updates state and log files in the state directory (created by ICM, with a name beginning with ICM-) and when finished creates the instances.json file, which serves as input to subsequent deployment and management commands. (See The Instances File in the chapter “Essential ICM Elements” for more information about this file.) By default, the instances file is created in the current working directory; you can change this using the -instances option, but note that if you do you must supply the alternate location by using the -instances option with all subsequent commands. Even when provisioning is successful, you can run the icm provision command again (with the -stateDir option) after making changes to your configuration files to alter the provisioned infrastructure. For example, you can change storage volume sizes for some of the nodes in the definitions file and execute icm provision again to reprovision with the new sizes. By default, when issuing the icm provision command to modify existing infrastructure, ICM prompts you to confirm; you can avoid this by using the -force option, for example when using a script. The commands in this section are used to manage the infrastructure you have provisioned using ICM. The icm ssh command can also be used in interactive mode to execute long-running, blocking, or interactive commands on a compute node. Unless the command is run on a single-node deployment, the -interactive flag must be accompanied by a -role or -machine option restricting the command to a single node. If the -command option is not used, the destination user's default shell (for example bash) is launched. See icm exec for an example of running a command interactively. Two commands described in Service Management Commands, icm exec (which runs an arbitrary command on the specified containers) and icm session (which opens an interactive session for the InterSystems IRIS instance on a specified node) can be grouped with icm ssh as a set of powerful tools for interacting with your ICM deployment. Both localPath and remotePath can be either files or directories. If remotePath is a directory, it must contain a trailing forward slash (/), or it will be assumed to be a file. If both are directories, the contents of the local directory are recursively copied; if you want the directory itself to be copied, remove the trailing slash (/) from localPath. The default for the optional remote-path argument is /home/ssh-user. The root directory of this path, /home, is the default home directory; to change it, specify a different root directory using the Home field. The user specified by the SSHUser field must have the needed permissions for remotePath. See also the icm cp command, which copies a local file or directory on the specified node into the specified container. ICM carries out deployment of software services using Docker images, which it runs as containers by making calls to Docker. Containerized deployment using images supports ease of use and DevOps adaptation while avoiding the risks of manual upgrade. In addition to Docker, ICM also carries out some InterSystems IRIS-specific configuration over JDBC. There are many container management and orchestration tools available, and these can be used to extend ICM’s deployment and management capabilities. iris  Contains an instance of InterSystems IRIS. spark  Contains an instance of InterSystems IRIS plus Apache Spark. The spark image allows you to conveniently add Apache Spark capabilities to an ICM-deployed sharded cluster. The deployed spark-based containers create a Spark framework corresponding to the deployment by starting Spark slaves on the DS nodes and a Spark master on the DM node, all preconfigured to connect to the InterSystems IRIS instances running in the containers. For more information on using Spark with InterSystems IRIS, see Using the InterSystems IRIS Spark Connector. To start Spark in the deployed containers when using this image, you must include "spark": "true" in the defaults file. arbiter  Contains an ISCAgent instance to act as mirror arbiter. The arbiter image is deployed on an AR node, which is configured as the arbiter host in a mirrored deployment. For more information on mirrored deployment and topology, see ICM Cluster Topology. webgateway  Contains an InterSystems Web Gateway installation along with an Apache web server. The webgateway image is deployed on a WS node, which is configured as a web server for a DM or an AM node; see ICM Node Types. By including the DockerImage field in each node definition in the definitions.json file, you can run different InterSystems IRIS images on different node types. For example, you must do this to run the arbiter image on the AR node and the webgateway image on WS nodes while running the iris image on the other nodes. When the DockerImage field specifies the iris or spark image in the defaults.json file and you include an AR or WS definition in the definitions.json file, you must use include the DockerImage field in the AR or WS definition to override the default and specify the appropriate image (arbiter or webgateway, respectively) and avoid configuration errors. Docker images from InterSystems comply with the OCI support specification, and are supported on Docker Enterprise Edition and Community Edition 18.03 and later. The version of Docker installed on provisioned nodes by the ICM command can be specified using the DockerVersion parameter; for more information, see General Parameters. You can also use the -image and -container command-line options with icm run to specify a different image and container name. This allows you to deploy multiple containers created from multiple images on each provisioned node by using the icm run command multiple times  the first time to run the images specified by the DockerImage fields in the node definitions and deploy the iris container (of which there can be only one) on each node, as described in the foregoing paragraphs, and one or more subsequent times with the -image and -container options to run a custom image on all of the nodes or some of the nodes. Each container running on a given node must have a unique name. The -machine and -role options can also be used to restrict container deployment to a particular node, or to nodes of a particular type, for example, when deploying your own custom container on a specific provisioned node. Another frequently used option, -iscPassword, specifies the InterSystems IRIS password to set for all deployed InterSystems IRIS containers; this value could be included in the configuration files, but the command line option avoids committing a password to a plain-text record. If the InterSystems IRIS password is not provided by either method, ICM prompts for it (with typing masked). For security, ICM never transmits the InterSystems IRIS password (however specified) in plain text, but instead generates a hashed password and salt locally, then sends these using SSH to the deployed InterSystems IRIS containers on the compute nodes. A container named iris containing an InterSystems IRIS instance with its initial password set as specified is deployed on each of the nodes; ICM performs the needed ECP configuration following container deployment. You must also include "Mirror": "True" to enable the mirrored DM node, as described in Rules for Mirroring. A container named iris containing both an InterSystems IRIS instance with its initial password set as specified and Apache Spark is deployed on each of the DM and DS nodes; a container named iris containing an ISCAgent to act as mirror arbiter is deployed on the AR node; ICM performs the needed sharded cluster, Spark, and mirroring configuration following container deployment. ICM prompts for the initial InterSystems IRIS password with typing masked, and a container named iris containing an InterSystems IRIS instance is deployed on the DM node, a container named iris containing an InterSystems Web Gateway installation and an Apache web server is deployed on each of the WS nodes, and ICM performs the needed web server configuration following container deployment. A container named customsensors created from the image sensors in your repository is deployed on the DM node. Without -container customsensors, this command would remove the iris container by default. The DockerRegistry, DockerUsername, and DockerPassword fields are required to specify and log into (if it is private) the Docker repository in which the specified image is located; for details see Docker Repositories. If you use the -namespace command line option with the icm run command to override the namespace specified in the defaults file (or the default of USER if not specified in defaults), the value of the Namespace field in the instances.json file (see The Instances File in the chapter “Essential ICM Elements”) is updated with the image you specified, and you must therefore also use the -namespace option to specify the created namespace when using the icm session and icm sql commands. For more information on the -options option, see Using ICM with Custom and Third-Party Containers. The -command option can be used with icm run to provide arguments to (or in place of) the Docker entry point; for more information, see Overriding Default Commands. Because ICM issues Docker commands in multiple threads, the order in which containers are deployed on nodes is not deterministic. This is illustrated in the example that follows. The following example represents output from deployment of the sharded cluster configuration described in Define the Deployment. Repetitive lines are omitted for brevity. At completion, ICM outputs a link to the Management Portal of the appropriate InterSystems IRIS instance. In this case, the provided Management Portal link is for the shard master data server running in the InterSystems IRIS container on ACME-DM-TEST-001. The commands in this section are used to manage the containers you have deployed on your provisioned infrastructure. If the -container restriction is omitted, all containers running on the nodes are listed. This includes both other containers deployed by ICM (for example, Weave network containers, or any custom or third party containers you deployed using the icm run command) and any deployed by other means after completion of the ICM deployment.. Status  One of the following status values generated by Docker: created, restarting, running, removing (or up), paused, exited, or dead. Health  For iris, arbiter, and webgateway containers, one of the values starting, healthy, or unhealthy; for other containers none (or blank). When Status is exited, Health may display the exit value (where 0 means success). For iris containers the Health value reflects the health state of the InterSystems IRIS instance in the container. (For information about the InterSystems IRIS health state, see System Monitor Health State in the Using the System Monitor chapter of the Monitoring Guide). For arbiter containers it reflects the status of the ISCAgent, and for webgateway containers the status of the InterSystems Web Gateway web server. Bear in mind that unhealthy may be temporary, as it can result from a warning that is subsequently cleared. 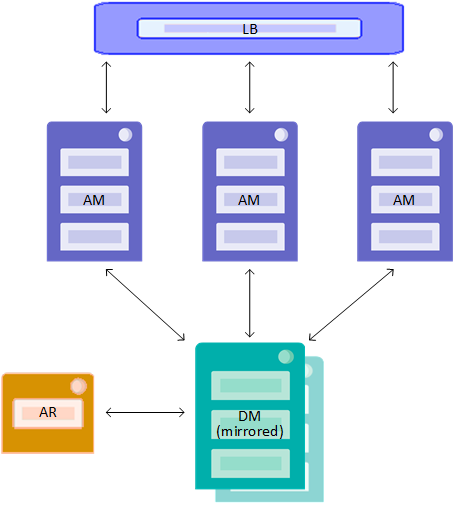 For an explanation of the meaning of each status, see Mirror Member Journal Transfer and Dejournaling Status in the “Mirroring” chapter of the High Availability Guide. Additional deployment and management phase commands are listed in the following. For complete information about these commands, see ICM Reference. Although the icm run automatically command pulls any images not already present on the host, an explicit icm pull might be desirable for testing, staging, or other purposes. The icm rm command deletes the specified container (or iris by default), but not the image from which it was started, from the specified nodes, or from all nodes if no machine or role is specified. Only a stopped container can be deleted. By staging the new image in steps 1 and 2, the downtime required between steps 3-5 is kept relatively short. The -image option is required for the icm upgrade command. When the upgrade is complete, the value of the DockerImage field in the instances.json file (see The Instances File in the chapter “Essential ICM Elements”) is updated with the image you specified. If you are upgrading a container other than iris, you must use the -container option to specify the container name. These commands let you interact with the services running in your deployed containers, including InterSystems IRIS. 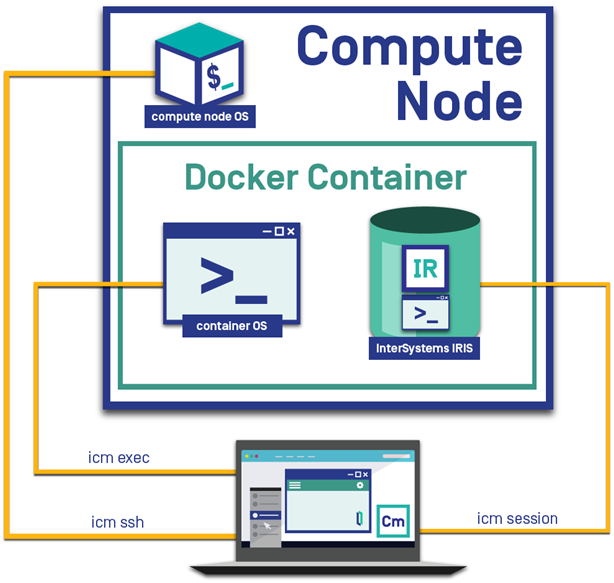 A significant feature of ICM is the ability it provides to interact with the nodes of your deployment on several levels  with the node itself, with the container deployed on it, and with the running InterSystems IRIS instance inside the container. The icm ssh (described in Infrastructure Management Commands), which lets you run a command on the specified compute nodes, can be grouped with the first two commands described in this section, icm exec (run a command in the specified containers) and icm session (open an interactive session for the InterSystems IRIS instance on a specified node) as a set of powerful tools for interacting with your ICM deployment. These multiple levels of interaction are shown in the following illustration. Because mixing output from multiple commands would be hard to interpret, when the command is executed on more than one node, the output is written to files and a list of output files provided. Additional Docker options, such as --env, can be specified on the icm exec command line using the -options option; for more information on the -options option, see Using ICM with Custom and Third-Party Containers. Another example of a command to execute interactively within a container is an InterSystems IRIS command that prompts for user input, for example iris stop: which asks whether to broadcast a message before shutting down the InterSystems IRIS instance. Both localPath and remotePath can be either files or directories. If both are directories, the contents of the local directory are recursively copied; if you want the directory itself to be copied, include it in remotePath. The remotePath argument is optional and if omitted defaults to /tmp; if remotePath is a directory, it must contain a trailing forward slash (/), or it will be assumed to be a file. You can use the -container option to copy to a container other than the default iris. See also the icm scp command, which securely copies a file or directory from the local ICM container to the specified host OS. The -namespace option can be used to specify the namespace in which the SQL command runs. The Docker command should not be long-running (or block), otherwise control will not return to ICM. For example, if the ---no-stream option in the example is removed, the call will not return until a timeout has expired. Because public cloud platform instances continually generate charges and unused instances in private clouds consume resources to no purpose, it is important to unprovision infrastructure in a timely manner. The icm unprovision command deallocates the provisioned infrastructure based on the state files created during provisioning. The -stateDir option is required. As described in Provision the Infrastructure, destroy refers to the Terraform phase that deallocates the infrastructure. One line is created for each entry in the definitions file, regardless of how many nodes of that type were provisioned. Because ICM runs Terraform in multiple threads, the order in which machines are unprovisioned is not deterministic. The -cleanUp option deletes the state directory after unprovisioning; by default, the state directory is preserved. The icm unprovision command prompts you to confirm unprovisioning by default; you can use the -force option to avoid this, for example when using a script.